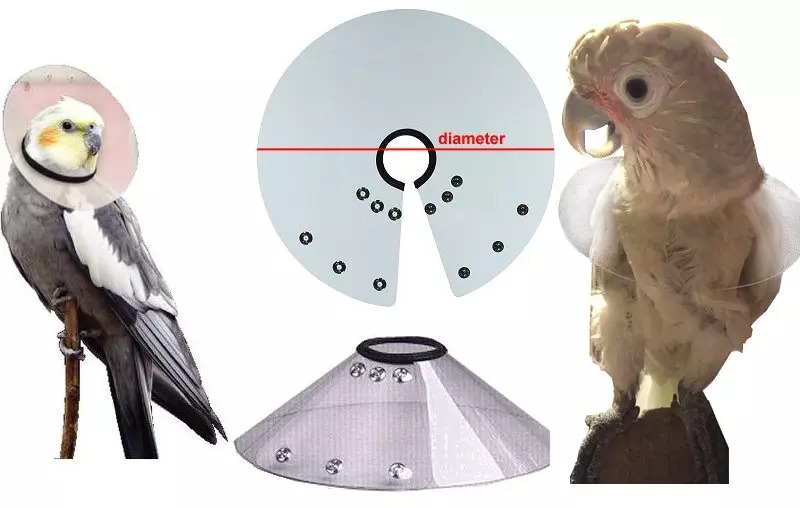 If the bird is considered physically healthy, then the bird's environment and psychological health need to be evaluated. The owner is often the best person to make this assessment. Situations which can be major plucking precursors include moving; new people, birds or animals in the house; breeding season; a change in the weather; a change in the cage location; a change in the bird's food; a change in YOUR daily routine; lack of sleep; lack of attention; lack of stimulation. Birds need as much as 8-12 hours of rest each day. A calm and dark room will give him restful sleep and provide warmth and security. A regular schedule is very important. Additionally, birds need a great deal of stimulation during waking time. The importance of toys must not be underestimated. A large variety of toys should be rotated often. They should include interesting toys, which can be manipulated, taken apart, put back together. They should be of different textures, sizes, shapes and colors. 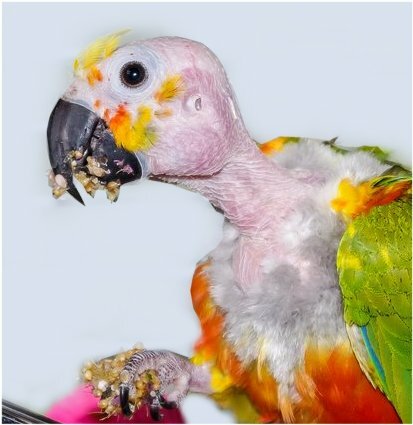 Birds which have a seemingly insatiable appetite for chewing must be given adequate items to alleviate their frustration or they will chew their own feathers. You can't have too many toys! Some birds start picking when they feel that Spring is arriving and breeding season is upon them. They begin to pick the feathers of the chest in preparation for nesting. In some cases a mate is the only answer. However, it is best to avoid sexually frustrating a bird by excessive petting, particularly around the vent area. Inadequate caging can cause problems. Not too large, not too small. Don't let toys CROWD the bird. Provide good, strong perches of varying diameters to be sure his feet are healthy, clean water and clean food bowls. It may be necessary to move his cage more into the family area. Or, perhaps move it closer to a window to observe the goings-on outside. Maybe the family area is TOO chaotic for adequate naps. Is he getting enough natural sunlight? You will have to be the judge after careful observation. His diet should include a well-balanced pelleted diet, some seeds, leafy green vegetables, fruit, maybe some yoghurt and cheese. Food is both a primary ingredient in diet and an experience: different tastes, texture, shapes and colors will invigorate your bird. However, be sure to change your bird's diet slowly under careful observation of his reaction and condition. After careful study, change just one thing at a time so you don't stress your bird. Note what affects him positively or negatively and work slowly and methodically toward a solution. It is usually possible to break the plucking habit by preventing boredom, relieving stress, developing a schedule, and giving optimum nutrition. If all else fails, try a safety shield. "I am writing this to tell you thank you so much for the e collars for my Goffin cockatoo!! I just put the 2nd one on him today to continue keeping him from plucking and biting his chest. He has grown back all the feathers on his chest and healed where he had chewed a hole in his chest! I had been making him leather vests in the past but he eventually chewed them up and they were difficult to attach as I used a safety pin in the back and he was always able to open them. When I first used the collar he was unable to eat or drink with it on so I turned it upside down and he could both eat and drink! He wears it 24/7 and it is lightweight and fairly comfortable as I can tell. I am sending photos to show you how it looks. He was bare before on his chest and upper legs with a wound on his chest. Today he is fully feathered and able to go without the collar on the weekends when he is monitored all day. THANK YOU for providing a simple and inexpensive way to help my special friend! !